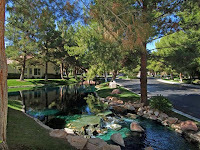 Spanish Trail is a guard gated community with 1,200 homes on the Western side of Las Vegas. Residents enjoy a championship golf course and country club, as well as a fitness center with pool and tennis courts. The location allows easy access to Summerlin and West side shopping and dining, and is only four miles from the Strip.